We’re proud to announce that our new website is now live! We’ve totally re-built this website from the ground up, focusing on making content easier to digest and find. 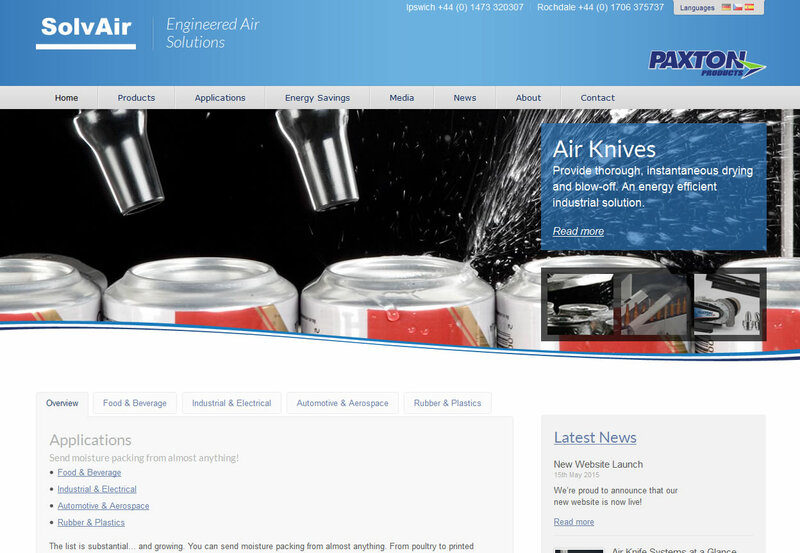 Hopefully we’ve made it much easier for existing and potential clients to find out who are, the Air Knife and drying solutions & services we have to offer – and how we can help. The new features which are key to this goal are detailed below. We’ve added brand new sections detailing Case Studies, Energy Savings & How Air Knives Work – all of which are key area’s of interest when we’re talking to both new and existing customers. We’ve also updated the Latest News section giving us more flexibility in how we add articles and enhancing how you can group and find the stories and categories that interest you. Visually the design and layout has been completely refreshed and updated to better reflect our branding and green, energy saving credentials. We’ve also taken the opportunity to re-build the site with a modern ‘responsive’ layout which better supports all screen sizes – from mobile phones all the way up-to extra large desktop monitors. We’ve also added a Video section, showing videos from Paxtons Vimeo Account and our our YouTube channel.